This is the first actual article of clothing that I have ever made. I was worried about how it would come out, since it was my first attempt, but I shouldn't have been! You use very large needles for this pattern and it worked up very quickly! 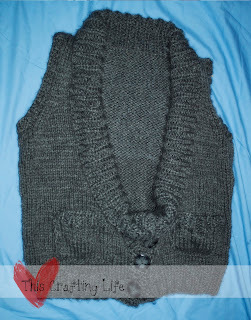 I had the entire vest done in about a week, including time for blocking and seaming. It's worked in multiple pieces, you work the back, two fronts and then join them, then work a collar all the way around. It worked up quick and easy, and I used a nice thick yarn which gave it a beautiful pattern. Overall, I'm very pleased with how it came out and my sister in law (who got it as a gift) just loved it!